Exclusive seafront villa with pool for rent in Umag Istria This exclusive seafront villa is nestled in Umag Istria provides its guests luxury accommodation and privacy ensuring a dream vacation while enjoying the smells of the Mediterranean garden and the Adriatic sea. The villa dates back to 1964, while it was renovated in 2010-2011. 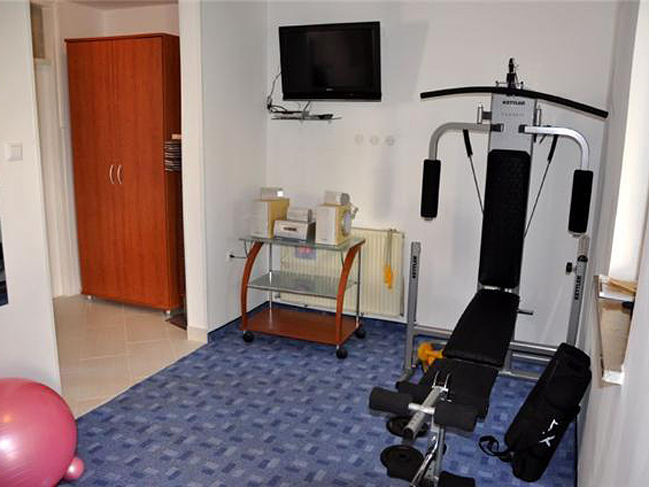 It has an exclusive location at the seafront in a residential part of Umag with open sea views. The villa itself has 450 m2, while the whole property stretches over 1000m2 surrounded by a handcrafted fence combining stone and iron. The surrounding of the villa ensures relaxation through sea-scented air and scents from the garden filled with Mediterranean plants. 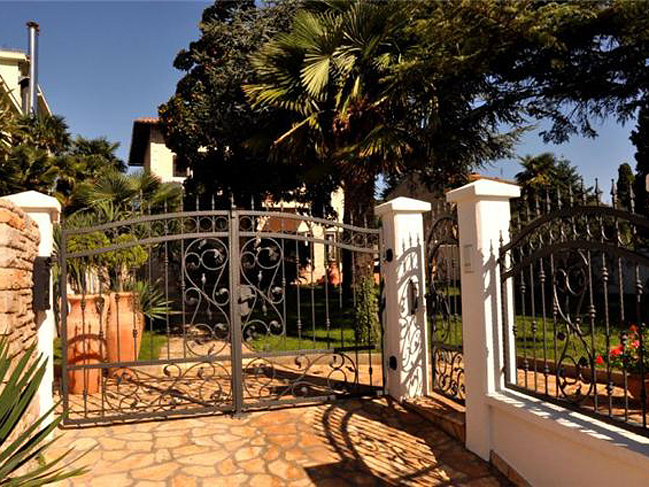 This villa is fitted in rustic style, with high ceilings and large spacious rooms. The oak floors decorate all bedrooms and living room, while the kitchens, halls and terraces are marble or terracotta Italian tiles. 1. CENTRAL LIVING AREA - located on the south side with open view to the sea and consists of ground floor and first floor. Ground floor: Large terrace which extends on the entire length on the South side of Villa, facing the garden which houses a swimming pool surrounded by Mediterranean plants and all trees of magnolia, pines and palm trees. Free-formed swimming pool is about 28m2, fitted with hydro massage, massage jets, summer and winter cover, automatic pool sweeper and solar-heated outdoor shower. The lower floor features a living room with marble fireplace, facing open view of sea and the yard. The large open floor plan provides a dining room and kitchen, along with a guest bathroom with shower stall. First floor: An oak staircase from the ground floor can lead to the first floor or to two side rooms (one with queen bed), small bath with shower and a laundry room with outside kitchen. When entering the first floor, guests are greeted with a loft with an entertainment centre and TV. On the left side, guests enter two comfortable bedrooms and a beautiful bathroom with shower. The bedrooms open up onto a large terrace that extends the entire length of the south side of the villa, with a view of the entire bay and the old city Umag. On the right side is a suite, a space that interconnects large master bedrooms and smaller children’s rooms, as well as a beautiful bathroom with a tub and a terrace facing the eastern backyard. The outdoor area includes a fully equipped kitchen, BBQ with a large marble dining table. From the eastern backyard, guests enter into a separate spa space, containing a fitness centre, Jacuzzi and a bathroom. 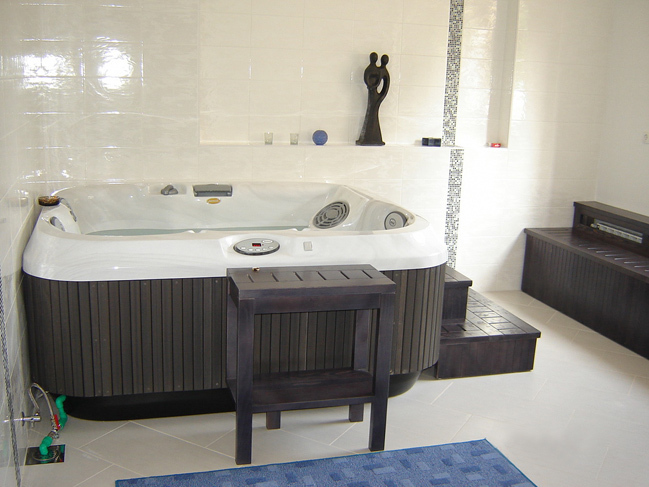 - SPA area with Jacuzzi pool, gym and bathroom with shower. 2. THE NORTHERN PART OF THE VILLA - consists of ground, first and second floors, which houses two completely separate apartments for guests and servants. Guests can use the apartment on the first floor, while the apartment on the second floor of the villa is used by staff, only during maintenance and cleaning of the villa. During your stay the staff does not live in the villa, as the villa is intended exclusively for residential guests. The apartment on the first floor has a separate back entrance, living room, bedroom with queen size bed, open plan kitchen, bathroom with shower and terrace. The apartment is completely furbished and equipped.